Save energy and water whilst enjoying an invigorating and enjoyable showering experience. The ecocamel aerated shower offers huge money savings for a very small financial outlay. So effective is this amazing water & energy saving handset that you will be amazed to discover that it pays for itself in just 8 short weeks! 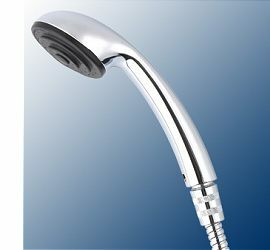 "The ecocamel felt just like a power shower because it gives excellent pressure"
LJMU proved that the ecocamel aerated handset uses up to 70 percent less water than conventional showerheads. This means that every time you take a shower you don't just save money but you actually make a difference to your environment by lowering your carbon footprint. This UK designed, low tech showerhead fits all standard shower hoses. Anyone can install it you just unscrew your old handset and screw on the ecocamel - it's that easy. The ecocamel is suitable for all homes and for all types of water pressure. The higher the pressure the better the performance, the lower the pressure the more satisfying the experience. The ecocamel eco shower has been given approval by the UK's leading authority on water efficiency Waterwise UK . Bluaway has been specially formulated for use throughout the washroom and to clean and maintain low volume or waterless urinals. 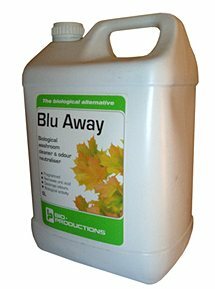 Bluaway eradicates odours and staining from urine whilst also degrading ulric acid and limescale deposits in urinals, toilet bowls and washroom surfaces. Containing millions of specially selected, highly active micro-organisms, with a refreshing mint fragrance, this unique biological cleaner is the perfect product to replace conventional washroom cleaners and provides the complete environmental washroom package when used with the Biofresh waterless / reduced flushing urinal unit. Bluaway: 5 ltr. Case of 4 @ £16.50 each: £66.00 plus £9.00 postage. Bluaway: 1 ltr. Case of 12 @ £3.30 each: £39.60 plus £9.00 postage. Bluaway: 750 ml. Case of 12 @ £3.50 each: £42.00 plus £9.00 postage. A unique, invisible skin protectant that features five moisturising agents. Allows skin to flex & breathe, while being protected, Forms a highly resistant barrier between skin & dirt, oil , grease, alkalis, acids, inks, tar & shop grime. Biofresh blue specially formulated Mint fragrance cleaner for washrooms and floors. Environmentally friendly, reduces ulric salt buildup and limescale deposits found in urinals. Biofresh Blue: 5 ltr. Case of 4 @ £15.00 each: £60.00 plus £9.00 postage. Biofresh Blue: 1 ltr. Case of 12 @ £3.00 each: £36.00 plus £9.00 postage. Biofresh Blue: Spray 750ml bottle: 12 @ £3 each: £36.00 plus £9.00 postage. 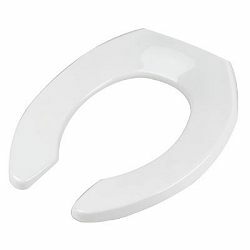 Vandal proof toilet seat designed for the heavy usage of clubs and pubs where vandalism is a problem. Helps prevent cross-contamination of many illness causing bacteria in schools, kitchen areas, surgeries, waiting areas, offices etc. Biostat-500 is a new breed of bonded antimicrobial coating technology. Biostat-500 is a professional grade biostatic treatment that inhibits damage & deterioration caused by bacteria, fungi, & algae growth. It is EPA registered for use on a wide range of surfaces including textile, porous & non-porous materials. Product Description: Biostat-500 is a concentrated, water based biostatic formula designed for control of micro-organisms on virtually all surfaces. Biostat-500 is an EPA-registered micro-biostatic product that provides long term antimicrobial performance. Unlike disinfectants that quickly dissipate and volatilise, the biostatic molecule bonds to surfaces providing residual protection long after ordinary disinfectants evaporate. Biostat-500 is a very durable, broad-spectrum antimicrobial that controls many disease producing bacteria (Gram+ & Gram -), fungi (mould & mildew) and algae growth on treated surfaces. This proprietary and patented formulation contains no heavy metals or volatile compounds. Once applied to surfaces, Biostat-500 is chemically stable, non-toxic, it will not leach or outgas, & is environmentally friendly. It is safe to use on all approved natural & man-made surfaces & will not discolour fabrics or react with metals or natural surfaces. Treatment protocol: Biostat Treatment - All surfaces within the facility can be treated with Biostat-500, an EPA registered disinfectant and biostatic antimicrobial product. Methods of application; Depending upon the nature and size of the area, surfaces can be treated by wiping surface with product or spraying/fogging large areas. Building Materials & Components - Wooden building materials, engineered timber, plywood, flakeboard, oriented strand board, particle board, fibreboard, sheathing, decking or planking, wall board, vinyl siding, plastic siding, wood siding, concrete and concrete products, cinder blocks, brick, stone, ceiling tiles, architectural metal, louvers, vents, coping, wood shingles, composite shingles, asphalt shingles, roofing granules, tiles, membranes, underlayment, wood shakes, felt, stone, concrete, asphalt coatings, cellulose insulation, fibreglass insulation, panel insulation, rigid foam, expanded foam, moisture and wind fabric barriers. Wall & Flooring Materials - Vinyl, plastic, wood, laminate, concrete, tile, stone, wallboard, gypsum board, plaster, EIFS wall systems, fibreglass, synthetic stucco, cinder block, brick, siding, wall paper and wall coverings, carpet, underlayment, mats. Fiber & Fabric Materials - Acetates, acrylics, cotton, fiberglass, nylon, lycra, polyester, polyethylene, polyolefins, polypropylene, rayon, spandex, vinyl, wool, orlon, silk, natural down, and blends of these fibers. While Biostats are durable, touch point surfaces do become abraded over time and use. Therefore, the product should be reapplied on a routine basis. Surfaces Include - Bathroom Surfaces, Public Areas, Countertops, Door Handles. Light Switches, Railings, Telephones, TV Remotes & Keyboards. Surfaces Include - Furniture, Outdoor Equipment, Seat Cushions, Appliances & Equipment. Hanoglove Skin Protection Cream reduces the formation of sweat and helps prevent the skin softening often caused by wearing airtight gloves. The cream is suitable for normal or sensitive skin. Hanoglove: 250 ml tubes: 25 @ £5.65 each: £141.25 plus £9.00 postage.